I read The Boyfriend List awhile back and enjoyed it but somehow didn't make it on to its sequel, The Boy Book, or any of E. Lockhart's other titles. 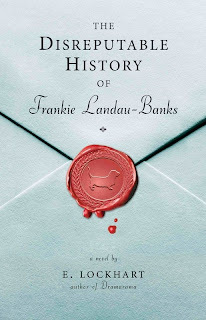 Then The Disreputable History of Frankie Landau-Banks came out and there was just so much buzz. And then it was named a finalist for the National Book Award. So I figured I'd better pick it up. Fortunately, Santa brought it to my home this year so I was able to jump right in. Frankie is a sophomore at Alabaster Prep, super exclusive boarding school for the children of the elite. Ever since she was a kid, Frankie had heard her father and his cronies go on about a mysterious secret society known as the Loyal Order of the Basset Hounds. Once she starts at Alabaster it becomes clear that the Order is alive and thriving and open only to males. When she suddenly gains a few curves in the right places and a snazzy new boyfriend to go with them, Frankie becomes aware in a way she hadn't been up to this point in her life. And when the darling boyfriend starts evading her all the time, haring off to locales unspecified with other guys she just knows are in the Order, she decides to follow him. What she discovers from following Matthew (and the subsequent actions she puts into motion) change Frankie (and the Order) permanently. For the better? That's up to the reader. I say yes, but the whole thing is still painful to watch. I am a bit conflicted over this book. For a variety of reasons. I felt like it really wanted to be Secret Society Girl meets Looking for Alaska. Not the best combination, IMO. This wasn't helped by the fact that I kept picturing Alpha (my favorite character) as The Colonel in my head. I usually quite like third person present narration, but in this case it felt slightly contrived, particularly since Frankie never gelled into a tangible character for me. I laughed several times while reading and I liked Frankie but I didn't love her. I liked her for her dogged attempt to wade through the ever shifting waters of a rather assaultive adolescence and an unsympathetically exclusionary pack of boys who told her they liked her but clearly didn't know her at all, nor did they seem to care to. Despite these obstacles, or perhaps because of them, she managed to carve out a place where she could be herself, free from manipulation. I liked her combative and compelling relationship with Alpha. In fact, I wanted more of that and less mooning over lackluster Matthew. But the book ended just when things were getting interesting. I suspect I would really enjoy a sequel.